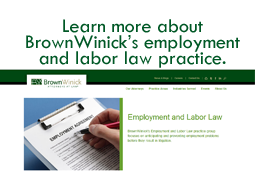 Workplace Wise - BrownWinick Employment Law Blog: Is OSHA's Proposed Rule On Improving Tracking of Workplace Injuries and Illness Really an Improvement? Is OSHA's Proposed Rule On Improving Tracking of Workplace Injuries and Illness Really an Improvement? 1. Certain establishments with at least 250 employees will be required to electronically submit their OSHA Form 300 on a quarterly basis to OSHA. 2. Certain establishments with at least 20 employees will be required to electronically submit their OSHA summary form 300A on an annual basis to OSHA. 3. Upon request from OSHA, certain employers will be required to submit specific information about cases from their OSHA 301 incident report. 4. Data from the 300A and 300, except the employee's name, will be available to the public via the Internet. The biggest concern about the proposed rule is that data that was previously available only to an OSHA inspector in reviewing an employer's OSHA 300 and 300A logs would now be available to the public for viewing on the Internet. This will no doubt cause many employers to be much more careful with their recordkeeping, resulting in selective recording of injuries and illnesses. The public posting of this information will also likely lead to employers being targeted by outside groups who characterize these employers as having bad safety records. Posting this information serves the public little good; it can be easily misinterpreted and lead to unfair conclusions or judgments about an employer or a particular industry. I am afraid that this will lead to many employers doing everything within their power to not report workplace injuries because it will then become public information. The injury and illness data that is going to be made public by the proposed rule will not include information that explains how the injury occurred, such as whether an employee acted in an unsafe manner or failed to follow an employer's safety rules. This incomplete information that OSHA intends to make public may allow competitors, plaintiff attorneys, unions, and others to distort the information and wrongly label employers as unsafe or bad actors. If anything concerns you regarding this proposed rule, OSHA will be accepting written comments regarding the proposed rule through March 8, 2014.